Cash flow is super-important. I need to know how much money I can expect to earn from game sales, tax breaks and whatever else may come my way in order to know how much runway (months I can afford to pay myself to work) I’ve got. Then I can plan what sort of projects I should work on, or if I should seek external funding etc. In order to predict cash flow for 2018, I looked at my 2016 sales and worked out how much revenue has dropped by in 2017. Then I used that drop to predict 2018 sales (see below). Well the obvious reason is that, apart from Shadowhand which released in Dec 2017, I haven’t released any new games since Regency Solitaire in 2015. Sales for all my old games naturally decline over time. Though another possibility is some of the distributors I use are in decline (such as the casual portals) or overcrowded (such as Steam) which would also affect my sales. 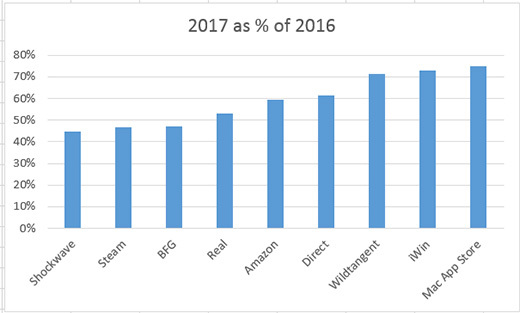 You can see from the chart at the top of this post that Direct Sales in 2017 were 62% of 2016, whereas Steam sales in 2017 were 47% of 2016. Some distributors like iWin (73%) and Mac App Store (75%) appear to be even more stable. A big worry for me is Big Fish Games (BFG) at 47% because they were previously my biggest source of casual portal income. Overall 2017 generated about 50% of the sales of 2016. I also worked out the drop in sales per game on the casual portals. This is interesting because my oldest games (Oz and Holiday Bonus) haven’t dropped much at all. This is because the long tail has pretty much stabilised for those games. Spring Bonus is a bit newer (2011), and Spooky Bonus (2013) and Regency Solitaire (2015) are newer still. So it seems reasonable that they may still be in a long slow decline rather than a stable long tail. 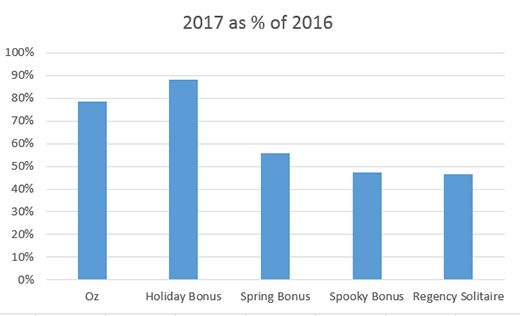 On Steam the values for Spooky Bonus and Regency Solitaire were very similar – around the 50% mark. So anyway, it seems reasonable to assume that 2018 will only generate about 50% of the revenue of 2017. However, if the casual portals decline rapidly this year, or the overcrowding of Steam and the general race to the bottom of discounts/pricing affects sales adversely, the figure could be lower than 50%. However, if my newer games (which generate the most revenue) begin to move into the stable long tail period, then it’s possible that revenue will be greater than 50%, though I doubt it would reach 75%. I have sent some of my games to two new distributors this week, and I might even try out itch.io at some point. So it’s possible that could boost revenue a bit more. We’ll see. The good news is that Shadowhand is on track to produce about as much net revenue per month as all my other games combined! That’s if we hit 3x week one sales in the first year as per this blog post. But we also have a few extra things planned that may boost the revenue from Shadowhand later in the year. So fingers crossed that those things work out! The bad news is that sales from my old games, Shadowhand, and tax relief (due about June) will only give us a 6 month runway with a livable salary, which isn’t very long. So we’ve got a couple of quick projects lined up that should start generating money in the second half of 2018. Also we just applied to the UK Games Fund for a £25,000 grant for a cool game concept that I’d be collaborating on with another dev if it goes ahead. So mega fingers crossed for that! If that fails I’ve got other things I could do that are short and involve reusing existing tech/IP. Ideally I’d get some investment in for those projects though to help with cash flow and paying artists. But I don’t need to cross that bridge just yet. This entry was posted on Tuesday, February 27th, 2018 at 2:05 pm and is filed under Business, Game Development. You can follow any responses to this entry through the RSS 2.0 feed. Both comments and pings are currently closed. Thanks so much for posting these blogs. I really appreciate your transparency in the matter as it helps a fellow game developer like myself see the bigger picture. Best of luck with your projects ! Thank you for writing these posts. It helps aspiring and new indies understand what to expect, and also gives everyone clear actions they can take when things are on the decline. I wish you had a longer runway than just 6 months, but I hope Shadowhand is a bigger boost than expected, and that those quick projects generate more than enough money to keep things going. Best wishes! Good stuff, thanks for sharing it! And it’s great you’ve got backup plans in place just in case. I watch so many folks not have that… Anyway, I appreciate all the info as we’re working on our own stuff and just starting out! All this experience to learn from is super useful.